Marquese Chriss‘ camp has spoken with the Rockets about the big man’s desire to see more playing time. If the team can’t find more minutes for Chriss, the preference would be a trade, Chriss’ agent Aaron Goodwin tells Chris Haynes of Yahoo Sports. The former No. 8 overall pick came to the Rockets in the Ryan Anderson deal along with Brandon Knight. Houston declined to pick up Chriss’ fourth-year option and he’ll become an unrestricted free agent this summer. Chriss seemed like a candidate to see more playing time with Clint Capela sidelined, though the team brought in Kenneth Faried and placed another frontcourt player ahead of Chriss on the depth chart. Nene and Isaiah Hartenstein, who was the team’s 2018 second-round pick, have seen more action than Chriss this season. Matthews got off to a strong start, reaching the 20-point mark in six of the first 10 games. An injury set him back as a mild hamstring strain kept him out of four games. He’s shot 33% from 3-point range in the last two games since returning to action. There’s always a market for players who can make the long ball but at his age, Matthews is probably looking at a short-term deal in his next contract and might have to settle for a second-unit role. Chriss received a fresh start when the Suns traded him to a contender. So far, Chriss has failed to take advantage of the situation, even after the club decided to part ways with Carmelo Anthony. Chriss has only appeared in seven games and hasn’t played more than eight minutes in any of them. It’s hard to believe he was chosen with the No. 8 overall pick in 2016. Chriss is still younger than many college players, so he’ll get another chance somewhere else, but he’ll have to settle for a modest contract. The Grizzlies brought in Mack on a veteran’s minimum deal to back up Mike Conley. Mack has been a steady presence in the rotation, averaging 9.9 PPG and 3.6 APG while keeping his turnovers down (1.3 per game). He’s also shot it well from long range (41.8%). Mack isn’t flashy but he’s a competent second-unit floor leader and he might get more than one year on the open market next summer. Mirotic made national headlines last season when Bulls teammate Bobby Portis slugged him during a practice dispute. Far removed from that incident, Mirotic is enjoying a career year with the Pelicans. He’s averaging 19.2 PPG and 10.5 RPG in 31.6 MPG. His 3-point percentage is down from last season but is still a solid 37%. Mirotic should receive plenty of attention on the open market as a stretch four who can also pound the glass. Gay had an ugly outing against Minnesota on Wednesday (three points in 19 minutes) but otherwise he’s been quite efficient this season. He’s shooting 49.2% from the field and 46.7% outside the arc and has also been a factor on the boards (7.1 per game). Gay has been thrust into a starting role with the injury-riddled Spurs but he’ll probably be looked upon as a second-unit contributor when he returns to the open market. He’s showing he still has something left in the tank. The Rockets have declined their fourth-year option on Marquese Chriss, tweets ESPN’s Adrian Wojnarowski. Houston hasn’t seen Chriss in action much since acquiring him two months ago in a trade with the Suns. An ankle injury sidelined him for most of the preseason and the start of the regular season, and he just made his official debut with the team last night. Chriss, who will be an unrestricted free agent next summer, would have earned $4,078,236 next season, which is now the maximum the Rockets can offer him in the first year of a new contract. Houston is hovering near the luxury tax with $131.5MM already committed for 2019/20, which likely factored into the decision on Chriss. The Suns were intrigued enough with Chriss’ potential to make a deal with the Kings and take him with the eighth pick in the 2016 draft. 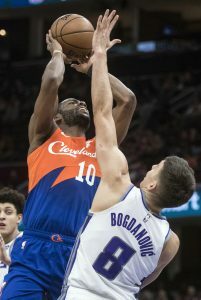 After a promising rookie year, he regressed last season, averaging 7.7 points and 5.5 rebounds in 72 games while shooting just 42% from the field. Chriss was sent to Houston at the end of August along with Brandon Knight in a deal for Ryan Anderson and De’Anthony Melton. He and Knight have reportedly been offered to the Timberwolves along with four draft picks in exchange for Jimmy Butler, but the Wolves don’t appear likely to accept that deal. Today marks the two-month anniversary of the Rockets acquiring Chriss and Knight, which means both are now eligible to be aggregated in a trade. Any team that deals for Chriss would also be limited to $4,078,236 as a starting salary in a future offer. 1:24pm: There’s a belief within the Timberwolves that Butler could target specific games to sit out, league sources tell ESPN’s Adrian Wojnarowski. However, he’s unlikely to miss high-profile matchups like Friday’s game against the Warriors, according to Wojnarowski, who adds that Butler is expected to play in Golden State. 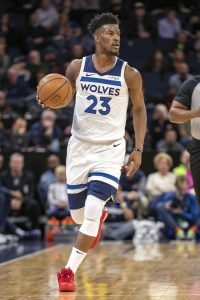 According to both Wojnarowski and Krawczynski, Butler’s camp remains frustrated with the Wolves’ inaction on his trade request and wants owner Glen Taylor to speed up the process. There’s a “collective belief” among Butler’s suitors that Thibodeau isn’t looking to seriously negotiate a trade yet, sources tell Woj. Addressing the Rockets’ offer specifically, Krawczynski notes that Minnesota isn’t interested in taking on Knight’s contract. The Rockets have made “no progress” on a Butler deal with the Wolves, tweets Sam Amick of The Athletic. 12:34pm: The situation remains fluid, according to Krawczynski, who tweets that Butler could very well return to the Timberwolves’ lineup for Friday’s game. ESPN’s Adrian Wojnarowski reports (via Twitter) that there’s an expectation Butler will fly to Golden State with the team for Friday’s game, adding that it was the Wolves that suggested the 29-year-old rest on Wednesday. Teams talking to Minnesota about Butler say the asking price remains high, per Woj. 11:57am: Jimmy Butler won’t play for the Timberwolves on Wednesday night against Utah, the team confirmed today. While the club cited “general soreness and precautionary rest” as the reasons for Butler’s absence, the four-time All-Star made the decision himself, informing head coach Tom Thibodeau of his plan this morning, according to Shams Charania and Jon Krawczynski of The Athletic (Twitter link). Charania and Krawczynski report (via Twitter) that Butler’s decision to sit tonight represents the “next step” in his continued efforts to push the Timberwolves to trade him. According to The Athletic’s duo, Butler’s absence could turn into an extended one. If Butler is healthy enough to play and is opting to sit out against the Wolves’ wishes, the team would have grounds to dock his salary for each game he misses. It’s not clear if that’s where this is headed though — when Thibodeau initially announced the news on Butler, there was no indication that the club wasn’t on board with having him sit out Wednesday’s game. This is just the latest development in a saga that has had its fair share of dramatic twists and turns since word of Butler’s trade request broke a week before training camps got underway. The All-NBA wing looks like a lock to be traded before February’s trade deadline, but he’s clearly hoping to force Minnesota to make a move well before then. The Heat and Rockets have been the teams most frequently identified as suitors for Butler, though Marc Stein of The New York Times wrote on Tuesday about “steady rumbles” around the NBA that the Sixers will eventually make a push too. Miami appeared close to landing Butler at one point during the preseason with a package centered around Josh Richardson and a first-round pick, but couldn’t finalize a deal. As for Houston, the Rockets reportedly offered Marquese Chriss, Brandon Knight, and four first-round picks for Butler. Since it has been two months since Chriss and Knight were acquired from Phoenix, those two players can now have their salaries aggregated together in a trade for salary-matching purposes, meaning that – as of today – such a deal would be allowed. However, the Wolves reportedly showed little interest in Houston’s offer, preferring a package that includes Eric Gordon. The Rockets are leaning against picking up Marquese Chriss‘ fourth-year option, according to Adrian Wojnarowski of ESPN.com. 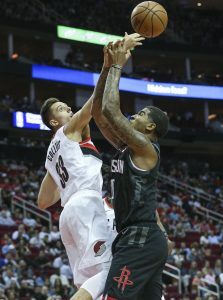 Chriss came to Houston along with Brandon Knight in a deal that sent out Ryan Anderson and De’Anthony Melton. The former No. 8 overall pick has yet to play this season because of an ankle injury, though he is expected to make his debut tonight against the Blazers. Chriss won’t be the only young prospect from the 2016 draft to have his option declined. Dragan Bender and Henry Ellenson are among those who will see the same fate. Jahlil Okafor and Wesley Johnson are among the other recent top draft picks who have not made it through year four of their rookie deals. Chriss has seen action in 154 games in his NBA career. He’s averaging 8.5 points and 4.8 rebounds per contest.